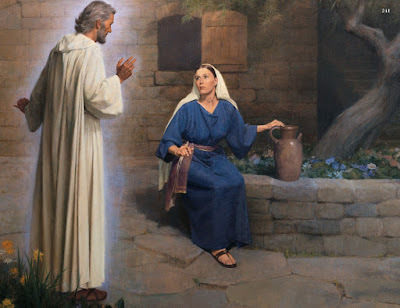 The Communion Veil: "Not My Son Lord"
One of the greatest mysteries in scripture is the hidden Mother. One of the greatest of these is Jochebed, the Mother of Moses. 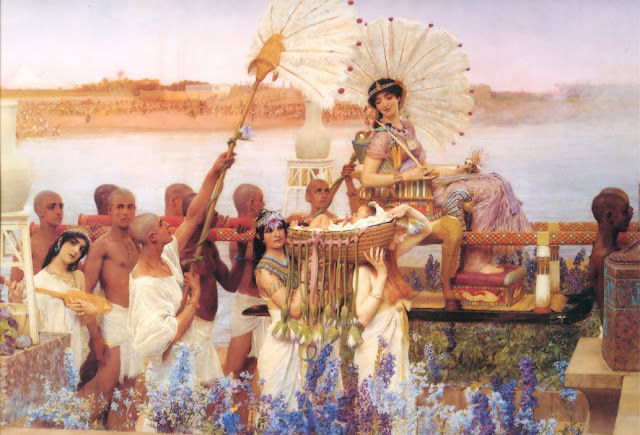 The scripture tells us that when the children where in danger of being killed by Pharaoh, Jochebed made a reed basket in which she placed Moses and floated him down the river. 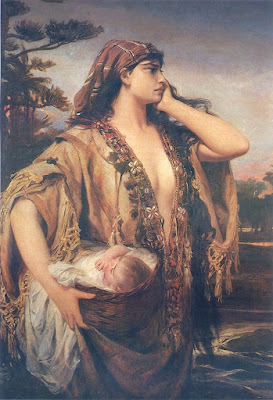 He was found by Pharaoh's daughter, and then as fate would have it, Jochebed was chosen to come and nurse the child until Pharaoh's daughter adopted him. When Moses fed at her breast Jochebed sang to him of her God and Moses's people, their ancestors. She sang to him in her own language trusting God that words sung with love from a Mother's heart would be etched on Moses's. When Moses was weaned he was then taken to Pharaoh's daughter to be part of her household, and to be taught about the Egyptian way of life and worship. This is when Jochebed's pain began. Jochebed loved God and she knew her son was being taught to worship idols which is very displeasing to God. Jochebed had no knowledge of what God would call Moses to do for the children of Abraham, but she trusted Him, and like any Mother who loves their child, she had no problem to completely focus on God with her petition. A Mother has no problem reminding God of what He has done in the past, to ensure a future promise. Can you imagine the pain she felt every time she saw Moses offer a prayer or an offering to a stone statue? The idols where everywhere, in every house. 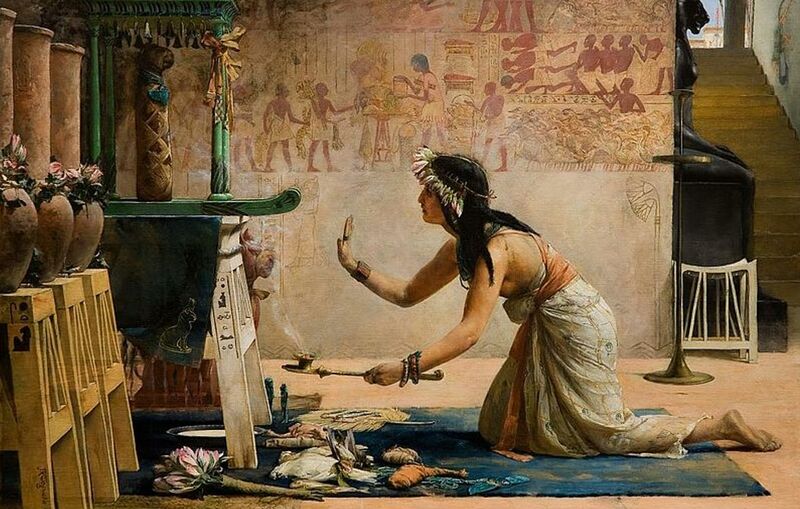 The Egyptians had power, wealth and influence, not her people. She was poor, a slave...but she had something powerful. She knew how to be hidden and how to focus on the one that could change her son's situation. God will hardly deny the tears and pleading of a Mother for her son, if what she asks of God is right in God's eyes and not mans. Sometimes a Mother helps give birth to greatness in a child just by accepting the suffering that God has chosen her to bear for that child. She placed him in the reed basket and pushed him into the water...."Lord, watch over my son as you watched over and protected Noah in the Ark." She is feeding her son from her breast..."God of our Fathers feed your word into my son's heart. She sees Moses offering prayer or food to an Egyptian God, an idol, then the prayers of a broken Mother's heart begin. "Lord, not my son Lord, my son is a son of Abraham. You are the Holy One, surely a merciful God will not allow my son to worship idols. Lord in your mercy did you not save an Egyptian from death who had taken Abraham's wife by warning him in a dream? Is my son less than this man to whom you showed such great mercy? God of our Fathers, God of Abraham, Isaac and Jacob deliver my son from the Idols of Egypt." In the morning she prayed, "God of our Fathers, God of Abraham, Isaac and Jacob deliver my son from the Idols of Egypt." During tasks she prayed, "God of our Fathers, God of Abraham, Isaac and Jacob deliver my son from the Idols of Egypt." In every possible moment throughout the day until she finally fell asleep she prayed,"God of our Fathers, God of Abraham, Isaac and Jacob deliver my son from the Idols of Egypt." One day as she went about her work she was alone when she was met by an Angel. "Woman, why do you plead so to God for your youngest child? Has God not already provided you a first born son to comfort you in your old age?" Kneeling before the messenger of God with many tears running down her face she said, "Can a Mother cut out part of her heart and she still live and breathe? A Mother's heart cannot be separated into the oldest or youngest or even the middle child. Each child beats the same in the Mother's heart and the Mother wishes no less for the youngest than she does the first." The angel answered her, "Fear not, for your prayers have been heard by God and by sorrow and separation your son will lead a great nation." Well, you know what happens after that. Never underestimate the prayers of the hidden Mother for her children...it can change the world. This story is obviously a fiction, but remember Jesus told parables so that truth could be taught from them. This is gorgeous. Thank you. My breath caught in places as I read. I have been having minor struggles with my children. To read this is the angel's prompt to turn my negative emotions into deeper prayer for my children. Thank you.